*The first Saturday of every month, Coatesville Library, 501 E. Lincoln Hwy, Coatesville, PA 19320. “Come and Read with Scooter”, 10:30-12N, beginning in May 2019. *The third Saturday of every month, Forks of the Brandywine Church, rear entrance, 1648 Horseshoe Pike, Glenmoore, PA 19343. “Come and Read with Scooter”, 10am-12N. The Forks Church is the home of the Sensory Play Day (SPD), a community outreach to families with children who have special needs. ​Who: We will be offering kids who have special needs, and their siblings, the opportunity to spend time reading to Scooter. What: Children will be offered 15 minute slots with Scooter. You are welcome to bring your favorite book or use one of ours! There will be play opportunities in a welcome/ waiting area, for parents and their children. When: Third Saturday of each Month. 10am - 12pm. Where: The Forks of the Brandywine Church, in the lower level. 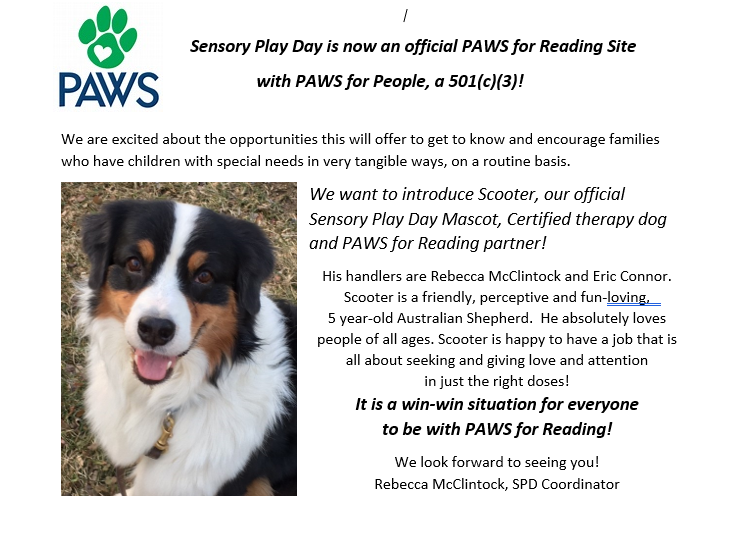 How: To sign up, please contact Rebecca McClintock at ​www.sensoryplayday.com Children will be assigned a 15 minute time slot, on a first come, first serve basis, so don't delay!